Home #PoCoLo #SSAA autism Brownies inclusion linky Magic Moments PDA Post Comment Love Small Steps Amazing Achievements Brownies. Would it be possible? Sasha has been looking forward to this Wednesday all summer long. She was so excited about the idea of being able to join the Brownies group with her big sister that my heart almost melted. Almost. It kind of groaned too. I didn't know if Sasha joining Brownies was going to be a good idea. Nothing is ever quite that straightforward round here. I'd originally encouraged Tamsin to join Brownies two and a half years ago so that she could socialise with other children who did not attend her school, and I hoped it would help build her confidence. It was also an extra chance for her to do something fun away from Sasha, which may sound mean, but I'm obviously aware that living with Sasha is not all sweetness and roses for Tamsin. Time off for good behaviour maybe? Tamsin has loved Brownies and I wasn't sure we should encroach on the fun she has there. There are extra sibling issues to the 'norm' here of course; Tamsin is acutely embarrassed of her younger sister with autism, who doesn't think twice about shouting out or doing things she is not supposed to do. Tamsin can feel the stares and strange looks from the other children, and she dislikes having to field their questions and try and explain why Sasha behaves in that different way. Of course she shouldn't have to, but without me there, there is no one else to deflect all that attention. I have seen from a distance how much it upsets her. I feel for her. Yet I also feel for Sasha, and of course I don't want to stop her taking part. Her autism brings enough difficulties which hold her back from groups anyway, so I'm going to do everything I can, bending over backwards to try and enable her to join in. She has tried ballet lessons previously but couldn't carry on as they were too structured and 'slow' for her. She'd do 10 minutes of dancing but then lie on the floor in the middle of the class, disrupting; she has a need for attention and control. Last term she did her first whole run of an after school club, doing gymnastics. She needed an assistant with her for the whole time though. Sasha needs direct instructions rather than group ones, and she needs someone to try and persuade her to stay focused on the task. That someone needs to be flexible and able to 'go with the flow' when Sasha has other ideas about what is fun. The PDA (Pathological Demand Avoidance) type of autism, which we believe Sasha shows signs of, causes great anxiety and a lack of awareness or understanding of rules generally. I wasn't even sure that Sasha would want to join Brownies, and I had concerns about how unstructured the Brownies sessions are. She needs to be not dictated to, but at the same time benefits from very clear instructions... there's a happy medium in there somewhere! When she asked if she could join, I had a word with Brown Owl and we went along for a trial session. We'd done a visit to the local fire station with Brownies the week previously (there are some perks! ), but it hadn't exactly gone swimmingly. 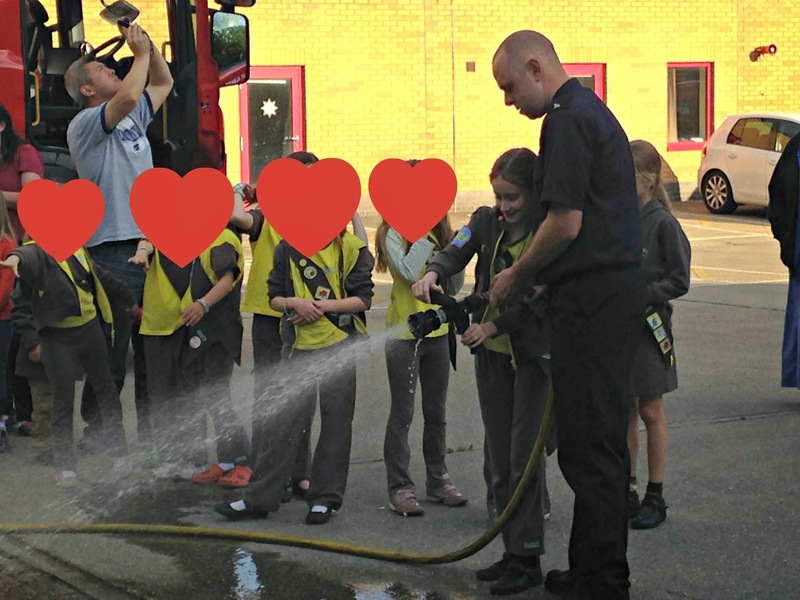 The Brownies were shown into a warehouse set up as a house with hazards and they had to work together to identify around 30 hazards. After spotting about 10 in two minutes, Sasha had done enough of that activity and so I had to wait outside the building with her. She did then join in with the walk through the fire engine but after that she was too tired to take part in squirting the fire hose, which I'd have thought she'd love. There was just too much noise and sensory stuff going on for her. Tamsin learning how to handle a Fireman's hose! Anyhow the next session, when she did her trial back at the school, actually went quite well - with me on hand in case of any upset of course. The group did some colouring, and played outside; lovely easy activities which Sasha enjoys. So Brown Owl kindly offered to let Sasha start this term. As long as I was able to stay for all the sessions with her. To be honest, I would have been the kind of mum who would have offered to help before this point, if it had been feasible. But with Sasha at home, I always dropped and collected Tamsin just like all the other mums. Tamsin would have been delighted if I'd have stayed to help sometimes, but it just wasn't possible. This is different though. I have to be there to help Sasha specifically, which I know makes Tamsin feel 'why her and not me?'. She understands Sasha's needs of course, but that doesn't mean she likes them. So how did tonight's session go? It started off with Brown Owl asking the Brownies to make a list of 100 things they were going to do over the next week (washing up, tidying rooms, reading etc). Sounds easy, huh? Slight issue in that Sasha has generally been refusing to write anything so far. So I groaned inwardly again and went to sit with her, expecting to have to scribe for her. As it turns out, I had to spell all the words for her, but she did the actual writing herself (a mix of capitals and small letters, but still) - 5 whole points (compared to Tamsin's 20)! Yippee! A small miracle just occurred, right there. After that and some small discussion which she was happy to join in with, we all went outside for some activity. Initially Sasha turned away from joining in with all the other Brownies who were playing a catching game in a big group, and she just wanted to play football alone with me, which is when I snapped this picture. I felt a bit sad as I did so, as although she was happy enough being apart from the others, she was very definitely not in their group. After a while though, I needed to pop back inside, and I gently suggested Sasha might now join in the ring and their organised group game - and she did, and they welcomed her! Two miracles in one evening. Not wanting to blow my own trumpet, but it's fair to say both those things might not have happened without my presence, as it takes a certain approach to gently encourage Sasha, and I'm well versed in that now. So whilst a huge part of me would rather not have to stay at every Brownies session from now on, and whilst it makes my heart sink a little because it highlights the whole time I'm there that Sasha is different, and I know it's an attempt to be inclusive but it doesn't quite reach fully inclusive, I do appreciate that Sasha's needs necessitate extra manpower. That's not her fault, or the fault of people working with her; it's nobody's fault, it's just fact. I'm just pleased that my girls can attend Brownies together.